Monday November 12th 1900 I called at Marties early and on Racheal Hess I then went on over to Andrews and to [Aunty] Adams before noon, took dinner at Joes and in the afternoon Verne and I went out to John Shorts. I stopped at Lizzie Duncans when we came back and we went over to Will for supper. Spent the evening there, stayed at Andrews all night. Tuesday November 13th 1900 I wrote some letters early and started out. Called at Anthony Woolfs, Eva Taylors, [Harty McKinteys], Ric Sanfords, and looked through our house before noon. I was at Maurice for dinner. I came up to Andrews and got my things and they with other friends went with me to the depot at four oclock. Laura was at the depot at Green Valley. I had a pleasant trip and when I got to the Harris house in Burlington found Ida Cutter and Birdie waiting for me. 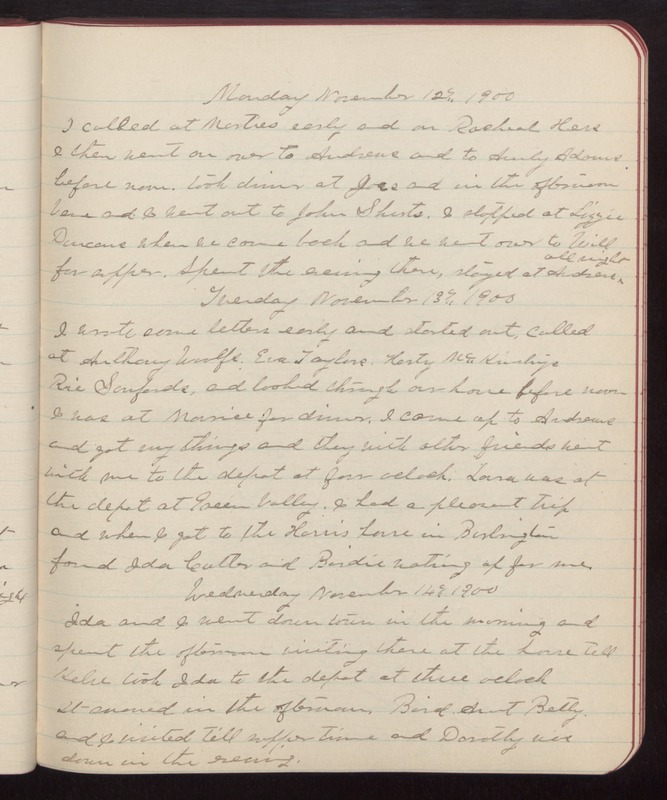 Wednesday November 14th 1900 Ida and I went down town in the morning and spent the afternoon visiting there at the house till [Kelie] took Ida to the depot at three oclock It snowed in the afternoon. Bird. Aunt Betty. and I visited till supper time and Dorothy was down in the evening.